The addition of fluoride in the Saskatchewan water district has caused health concerns among its residents. Excessive fluoride has been known by dental professionals to cause flourosis in children. Some people in China who have drunk fluoridated water supplies since childhood are unable to walk after their bodies absorbed the toxic residues of fluoride taken into the stomach. Such toxic ingredient are used in rat poison. Much of the ingredient in fluoride is residue disposed from the manufacture of fertilizer, to avoid the liabilities of disposing such toxic waste. More details can be found in the library section of SafeSaskWater.org. These issues, supported by scientific studies, seem not enough to convince governments to stop mixing fluoride into water supplies. 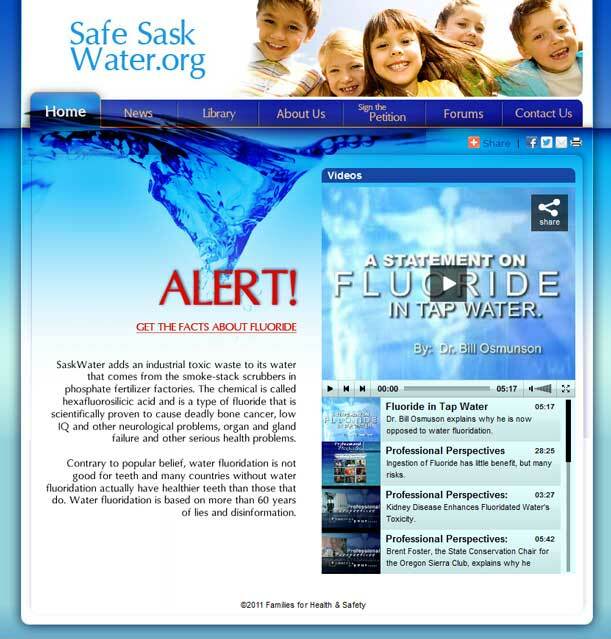 SafeSaskWater.org was created to educate the unknowing public about the health hazards of fluoridated water. Blue is the predominant color, expressing pure, clean and safe water. Efforts were made for the design to look professional as the then predominantly red Canadian dental association web site, mimicking its styles.